Hands in the earth, a photo by The Bacher Family on Flickr. One of my favorite photos from National Public Lands Day this year is this simple image of a woman's hands finishing the work of putting a plant in the ground at the revegetation site at Sunrise. I try so hard, in most cases, to capture a face in my images, to show the concentration or contemplation visible in their eyes, to use those cues to convey the emotion of the image. This photo is a reminder that there are other ways of doing so -- that even without a face, you can see the care, the passion, the commitment that goes into putting a plant in the soil, on faith that it will contribute to the rebirth of a meadow where once there were only scars on the land. 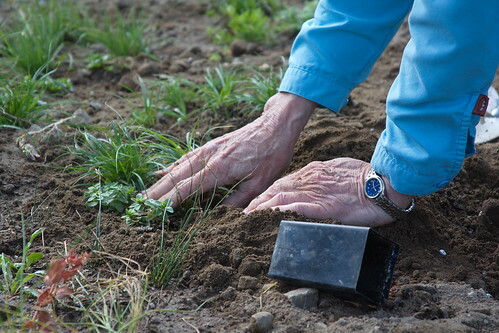 For me, the fact that these are old hands only reinforces that message; this is someone who has had a long time to set her priorities, and she is here, gently smoothing the soil around a new plant. I also, incidentally, like that the pot the plant came out of is visible in the photo, and that the color of the watch matches the sleeves, and that the depth of field is narrow enough to keep the hands in focus but not the plants around them. It's not a perfect shot, but It speaks to me, and for me, that's satisfying.